1. Lake Tahoe is as long as the English Channel is wide. 2. Lake Tahoe contains 122,160,280 acre feet of water, or over 30,000,000 more feet than the combined capacities of ten of the largest man-made reservoirs in the United States. 3. The state of California would be completely covered to a depth of 14 and 1/2 inches, with one dispersion of Lake Tahoe's water. 4. On an average, 1,400,000 tons of water evaporates from the surface of Lake Tahoe every 24 hours, yet this drops the lake level only one tenth of an inch. 5. Lake Mead is backed up 227 miles by Hoover Dam into the Grand Canyon of the Colorado and is considered one of the largest man-made lakes in the world. Lake Tahoe contains nearly four times the maximum capacity of Lake Mead. 6. Lake Tahoe never freezes over due to the constant movement of water from the bottom to the surface. This "turnover" allows an enormous mass movement of water, and keeps the Lake, ice free. 7. 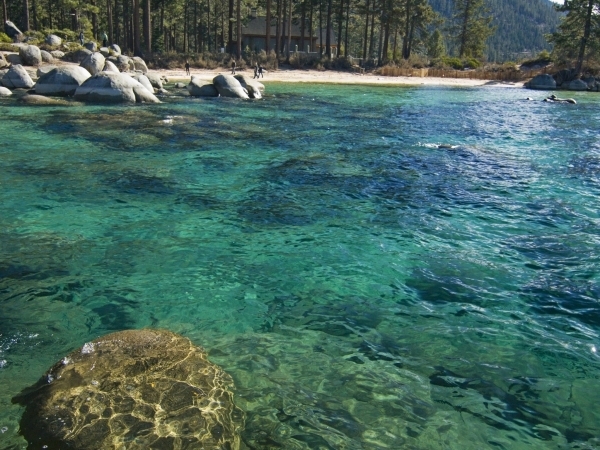 There are 63 tributaries draining into Lake Tahoe with only one outlet at the Truckee River. 8. Lake Tahoe is the highest lake of its size in the United States. 9. Only two lakes in North America are deeper than Lake Tahoe. Crater Lake in Oregon (1930 feet), and the Great Slave Lake in Canada (2010 feet).